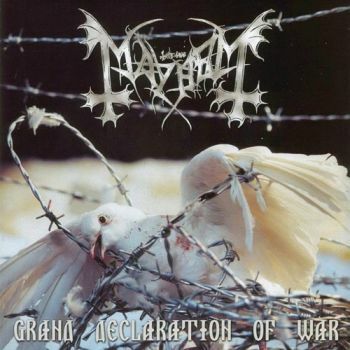 MAYHEM - GRAND DECLARATION OF WAR DELUXE REISSUE (2CD) | Online Shop | Wizard LTD. Album: "GRAND DECLARATION OF WAR DELUXE REISSUE (2CD)"
Simultaneously with the release of new single “Psywar”, cult album ‘Grand Declaration of War’ (2000) is reissued in a 2-CD edition including 2001’s ‘European Legions’ as a bonus disc. The latter is made of seven live recordings of MAYHEM classics, as well as five tracks from ‘Grand Declaration of War’ in pre-production versions. ‘Grand Declaration of War’ sold 70,000+ copies worldwide. ‘European Legions’ is the perfect companion to GDOW and gathers the best of the band’s first 15 years. For fans of: MAYHEM influenced IMMORTAL, SHINING (SWE), MARDUK, DEATHSPELL OMEGA, and many more.